Muddy Trail Running at its best! When was the last time you ran a race just to have fun? After the Boston Marathon I wasn’t planning on racing for a little while. However when my two amazing friends asked me to run the Muddy Moose 14 miler I decided it would be the a fun adventure and good medicine for my soul. Being with my friends provided the healthy laughter that I needed and running the gorgeous trails in the fresh air brought me peace. 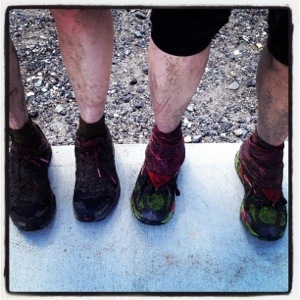 The original Pete & Gerry’s Organic Chicks ready for some muddy trail running. 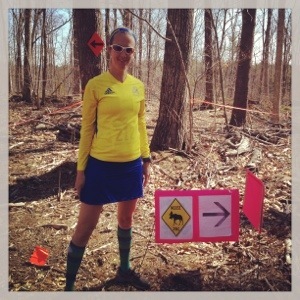 I proudly wore my Boston Marathon colors and got ready for a muddy adventure. I had no expectations but wasn’t sure if my legs would carry me. Bridget, Joanna and I warmed up and checked out the start of the course. The ground seemed fairly dry which I would later discover was not true. The race director gave us all hints of the mud that was to come on the Muddy Moose trail racing adventure. The pace was fast off the line and as we turned onto the trail the mud greeted us. At first I tried to maneuver nimbly around the ever growing mud pits left in the wake of strong strides. But after a bit I decided to just go forth and have fun and get dirty. A few moments after this decision I ran into the quicksand mud and my left shoe was promptly sucked off of my foot. Rather than discouraged this made me laugh. I pried my shoe out of the gooey mud and tried to find a solid pace again. After about two miles the trail evened to a nice dirt road by a lake (it was hot at the race and very tempting to bail out and jump in the icy waters). Then there was some climbing up to a beautiful vista. It was so peaceful in the woods, calming and healing.Just me and the trail and the occasional other racer. Amazingly my legs felt strong and I was able to focus on my strengths. I absolutely love the technicality of trail running. Nimble footsteps hopping over rocks and roots, and weaving around trees. The sweet smell of the earth and the giant canopy brightened by patches of cerulean blue. The other runners too were quiet and focused on the terrain. Eventually I began to see racers returning on the out and back course as we headed towards a “choose your own adventure” pathway. 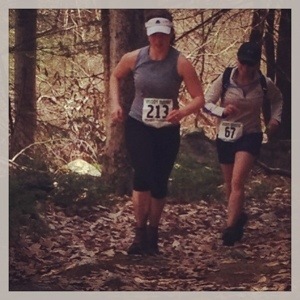 My friend Bridget came flying by, a flash on the trail racing to stay ahead of the pack. The course had a lollipop loop and you could run either direction. I chose to go left and was surprised by a water crossing that was “skirt high,” reaching the lower edge of my Skirt Sports. The icy water felt refreshing but shocked my legs. My pace coming out was slowed by frozen muscles (nothing like a quick ice bath mid-race). But I quickly got back in the groove for seven miles back. The course was an out and back which is great if you are feeling good because you have already seen the terrain. On the way back I actually felt pretty amazing. Perhaps it was the endorphins. The other racers on the course were friendly and there were lots of big smiles (because who doesn’t like playing in the mud!). The toughest part about the race was that I was hungry and needed more water as it was hotter than expected. I usually come well equipped with plenty of Ignite Naturals Reload Energy gels but for some reason didn’t bring enough. For the last two miles all I could think about was food and rehydration. My finish time was 2:24.16, 7th female, a strong finish post Boston. The hose at the finish was definitely needed! 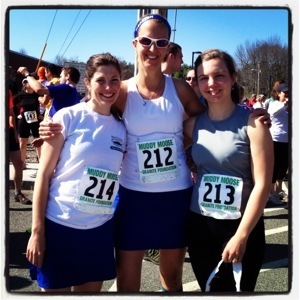 I would definitely do The Muddy Moose 14 miler again next year. It was a challenging course but a blast in the mud and the trail running was gorgeous! Have you ever run a super muddy trail running race? 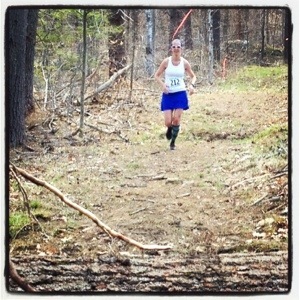 My friend Joanna rocking the muddy trail at the Muddy Moose 14 Miler. 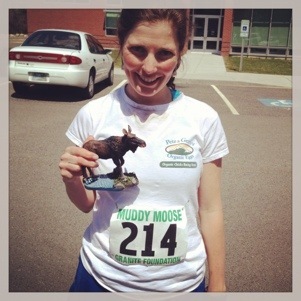 The Women’s Winner at the Muddy Moose 14 Miler showing off her Moose Prize.